The wildfire situation in northern California is slowly improving, but there's still a lot of work to do. The high winds fueling the spread of northern California's wildfires died down a bit Sunday, giving firefighters a chance to gain some control over the blazes. Fourteen fast-spreading wildfires have burned more than 213,000 acres as of Monday. They've destroyed thousands of homes and structures and killed at least 41 people. But the tide may be changing. Many evacuation orders were downgraded Monday, allowing tens of thousands of people to return home. 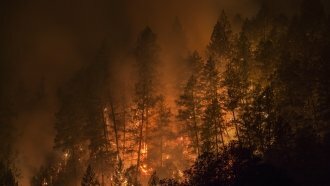 Northern California's hot, dry winds, known as "Diablo winds," were a major contributing factor to the fast spread of the fires. The nearly hurricane-force gusts can make a fire's growth unpredictable and tough to contain. Those winds combined with low humidity create a perfect storm for a raging fire. Firefighters have been able to make some progress as those winds abated, but there's still a lot of work left. Two of the largest fires, the Nuns and Tubbs fires, were 50 percent and 70 percent contained early Monday evening. More than 40,000 people remain under evacuation orders.